There are ~3,400 yellow markers for vulnerable cameras, and ~700 red markers for "HACKED" cameras (note in some cases, the OSD text is disabled, so while the camera name has been altered, it may not be shown in the image). The average firmware found on the vulnerable cameras had a build date over 2 years old, showing that many users do not update firmware once a device is setup. Did the camera have its name changed to some variation of "HACKED"
If the above criteria were met, a snapshot image using a public URL (/onvif-http/snapshot?auth=YWRtaW46MTEK) was taken and logged, along with latitude/longitude coordinates provided by the IP geo lookup. These scans were done throughout December 2017, though some devices had inaccurate time stamps that may indicate other dates. IP address geolocation services typically do not provide precise locations, so camera locations shown will be accurate to a general area but not the exact location. 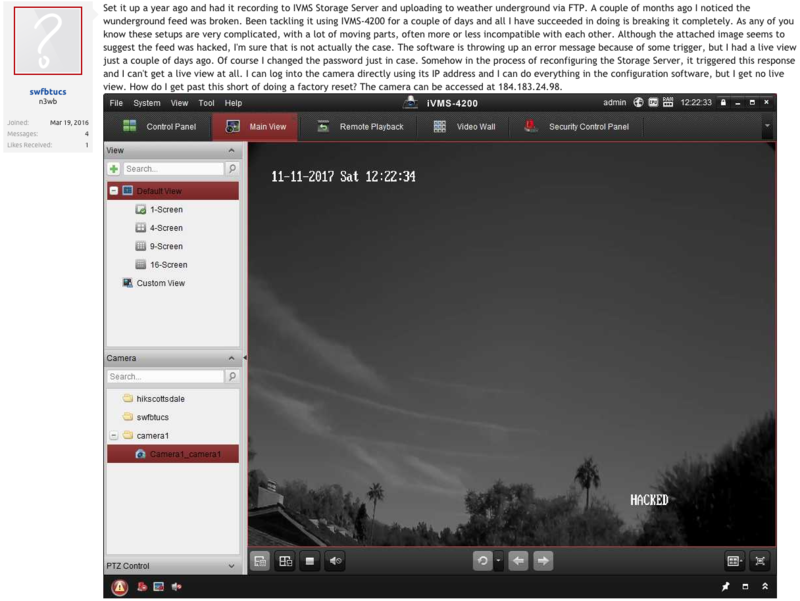 The geolocation data was used to plot points, using Google Maps, with the snapshots associated with each camera/location to be displayed when hovering over the point. The EU General Data Protection Regulation (GDPR), set to go in effect May 25, 2018, specifies potential fines for companies that expose data that can directly or indirectly identify a citizen of the EU without their consent. By shipping cameras with a hard-coded backdoor, Hikvision exposes EU citizens to such data disclosures without consent. 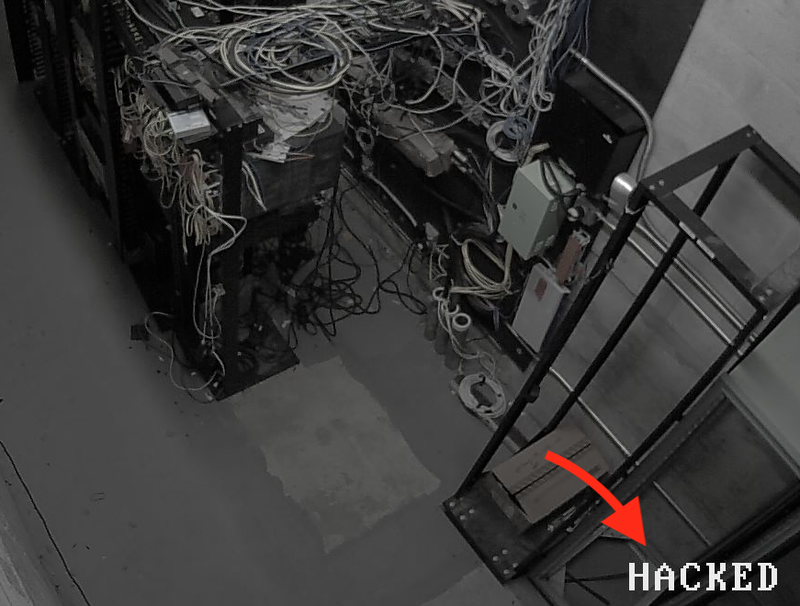 Though Hikvision argues they patched the backdoor once they were made aware of it, they still shipped millions of cameras with this vulnerability, of which numerous are installed across Europe. Many owners of these cameras are unaware of this backdoor which exposes their cameras. This map shows only Hikvision-branded cameras, if OEMs are included (see 80+ Hikvision OEM Directory), the map would have 5,000+ points in the US alone, and many more in Europe. Additionally, while Shodan has a large number of Hikvision devices in its database, Shodan does not represent all of the internet-accessible Hikvision devices. Devices are added (or removed) daily, IP addresses may have changed, or units may have been temporarily offline during scans. While it is impossible to estimate what percentage of accessible Hikvision devices are in Shodan's database, we can guarantee there are more vulnerable/hacked devices than just those shown on the map. 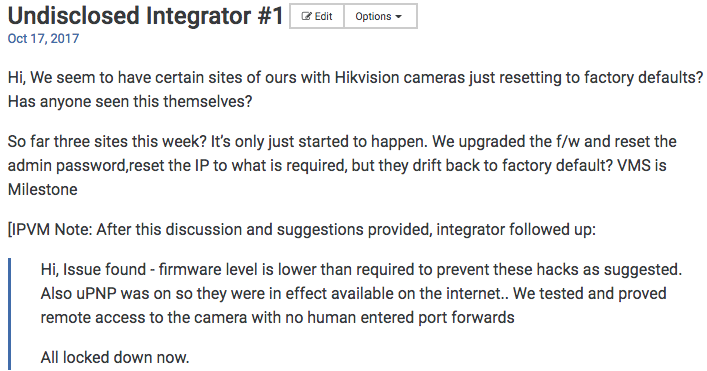 Many Hikvision IP cameras have been reported as being brought offline, either to update firmware and resolve the vulnerability or to remove remote connectivity to them when users realize the risks of placing vulnerable cameras on the internet. These cameras, by definition, are excluded, since they can no longer be reached. The number of Hikvision cameras that have been hacked in some way are certainly far greater, since this map only shows IP cameras that have not been fixed by December 2017. The reports of hacking peaked in October and November (following the September disclosure here), giving users a month, or more, to notice and resolve these issues. Other ipcamtalk threads from users experiencing cameras being factory reset via the backdoor exploit: 1, 2, 3. Make sure you can trust the intentions and competence of the video surveillance manufacturers you select. Timely update your device's firmware. Beware of manufacturer's UPnP settings (see Hikvision UPnP Hacking Risk). Do not port forward your devices (pace Hikvision Hardening Guide Recommends Port Forwarding). Strongly consider using VPNs (see VPNs for Video Surveillance). Comments (73) : PRO Members only. Login. or Join.